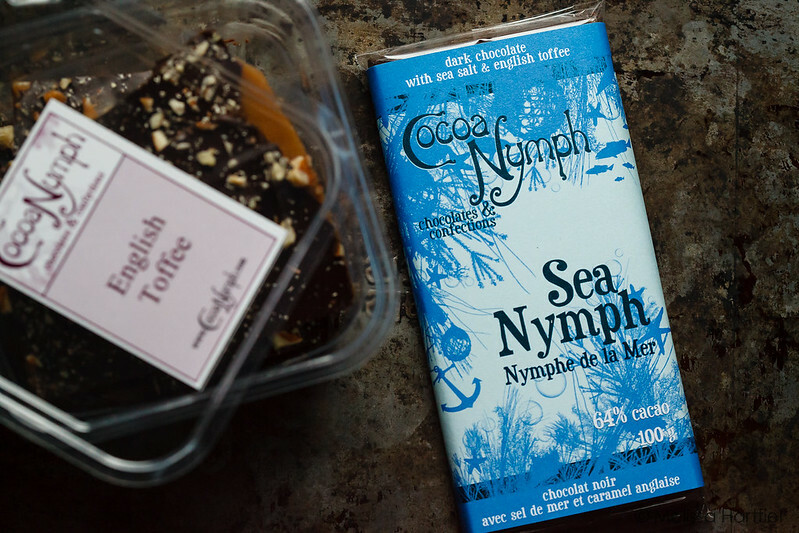 Last week Sean and I had the opportunity to visit Cocoa Nymph Chocolates and Confections, here in Vancouver, and have a behind the scenes look with owner and head chocolatiere, Rachel Sawatsky. Like getting a golden ticket. Except, it was just the two of us, and we got to try stuff and nobody got carried away by oompah loompahs or blew up like a giant purple blueberry. Ok… so it was all awesome except for the part where I pulled my camera out and… realized my battery was stone cold dead. And I didn’t have a spare. (please refer to the post on “Becoming a Professional Food Photographer is Scary” in which I refer to being terrified a client will say “oh we thought you were a real food photographer”). Holy #fail Batman. I was so embarrassed and felt like such an idiot. I cannot repeat that enough… SUCH. AN. IDIOT. I thought I’d at least redeem myself by pulling out my little Canon P&S which I always, always, always keep in my camera bag. No go. After scrambling around I remembered I had put it in my purse the week before. So much for that whole “professional” thing. Head–>Wall. Anyhooooo… let’s move on shall we? (Rachel was absolutely lovely and gave me a box of this year’s Holiday Truffle collection to take home and shoot so I hope I did them justice!). We visited the newest location, Cocoa Nymph East at 7th and Ontario (their original location is Cocoa Nymph West at 10th and Alma) and got a sneak peek into the inner workings of this chocolate heaven. Everything at Cocoa Nymph is completely handmade, in small batches. on site, at one of their two locations, including all product that is sold in specialty shops. It’s all wrapped and boxed on site as well. It’s truly a local small business. When we arrived Rachel was preparing a batch of the centrepiece of her new Holiday Truffles reindeer inspired collection, the Rudolph (a white chocolate and peppermint ganache in a white chocolate shell). She happily chatted with us about her recipes and how she went from studying microbiology to becoming a chocolatiere while we watched as she prepped the base for the shell and let it set – and then she let us sample some fresh from the mold before we left. They were perfect! Dasher – milk chocolate with raisons and port in a dark and white chocolate shell – my third fave… but I have about 5 third place favourites…it’s too hard to choose! 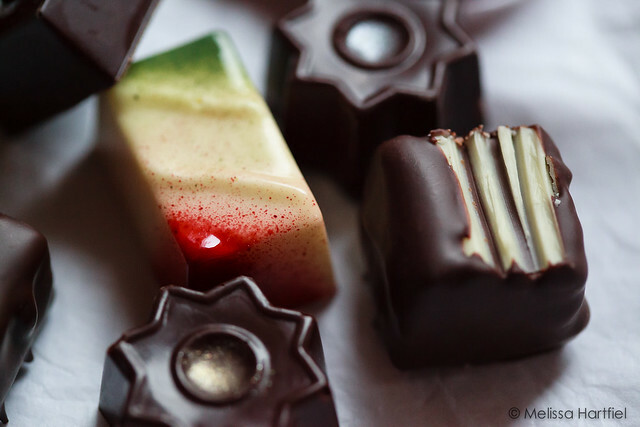 Blitzen – maple and bourbon in a milk chocolate ganache in a dark chocolate shell – nice and boozy! Yes, I keep a stash of high quality, artisan chocolate bars in my office – I snap off a square or two when I need it. Seriously, I recommend it… they’re not cheap, but good quality chocolate is a treat worth having. I’m amazingly self-disciplined with it too. One bar can last me weeks (unlike a cheap Cadbury fruit and nut which is gone in a 30 minutes a day). But one of the biggest treats of getting to spend some one on one time with Rachel was getting to meet and connect with another fellow female Vancouver small business owner. She was lovely, generous with her time and remarkably frank about the trials and tribulations of getting a small business up and running (many of which I’ve faced myself) and also with how awesome it can be (which I also totally relate to!). We had a great discussion about how small businesses affect and are affected by the communities in which they operate, and how amazing it can be when the community supports you – so true! But most important was seeing Rachel’s passion and enthusiasm for what she does – it’s infectious and even though I don’t make chocolate, I left feeling the urge to go home and design something new. Passion is infectious – it’s so important to surround yourself with it! careful – the box can empty out quickly! 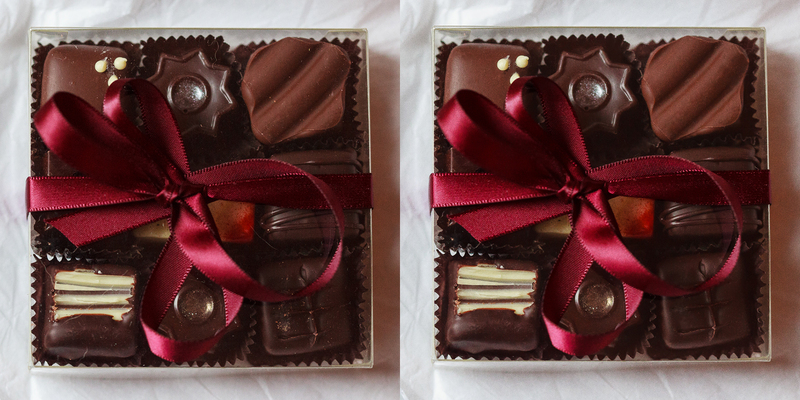 The Holiday Truffle collection is available at both their locations. Truffles sell for $1.95 each or $16 for a complete 9 piece box. A lovely treat for anyone to find in their stocking, randomly left on their desk, slipped in a coat pocket or to give as a hostess gift (or… a treat for yourself after all that Christmas shopping… ). Thanks again to Rachel for being so generous with her time and for letting us try out her delicious collection of holiday treats! I actually spend a lot of time photographing chocolate, virtually none of which winds up here because I still feel like I need way more practice. That bar collection I mentioned earlier? I’ve photographed every single one of them! artisan bars are often beautifully designed so you will want to take a photo of the whole bar. 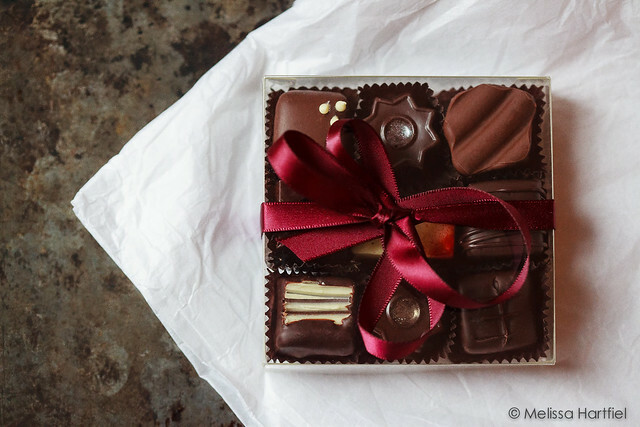 To avoid a completely flat, one dimensional look try photographing it in its open wrapper. once you’ve photographed the entire bar, try snapping it in pieces and piling them up like you would with cookies. Chocolate aficionados love a good “snap” to a bar when you break it up so showing the bar broken up can actually be appealing! Be prepared to dive into Photoshop. Chocolate damages sooooo easily and even the tiniest little nick and scratch shows up like a giant yellow labrador hair on a black sweater (not that I would know anything about that – my black sweaters are covered with yellow lab fur so they don’t really stand out…). If you have to transport the chocolate more than a few metres, it’s going to accrue some damage. 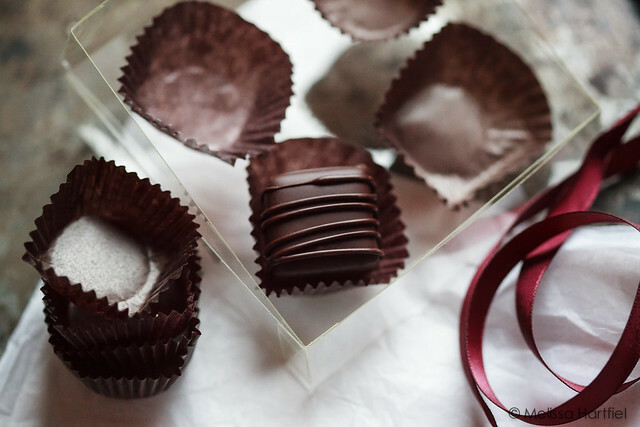 Lightroom’s cloning tool will help you with some of the larger blips but, I don’t find it to be anywhere near sophisticated enough to fix chocolate. Only Photoshop’s cloning tool will really do the trick. And it can take a good 20-3o minutes of patient detailed work to fix some images. 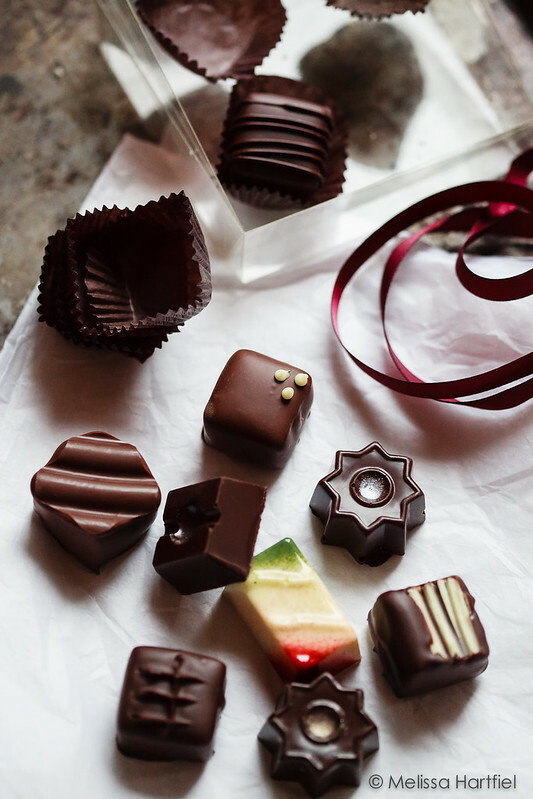 If you’re in Vancouver, be sure to check out Cocoa Nymph (they also offer chocolate making classes. And for those of you not in Vancouver, Rachel told us the new Cocoa Nymph website will be up and running very soon! I think you did the box of truffles justice. The photos look great. The chocolates look great. Love the reindeer collection. A box of Blizten and I’d be blizted! 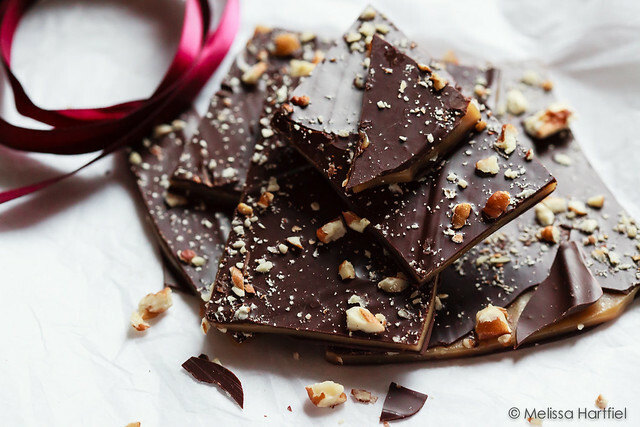 I love dark chocolate and I know it is better for you than milk chocolate. What is your secret to having a Cadbury Fruit & Nut last you 30 minutes? I can’t hang onto mine for more than ten. OMG! Ummmm goodness gracious…I will take all of them. Doubled! Unwrapped, that chocolate bar looks even better! The tips about shooting chocolate are great~! Too made things aren’t as perfect as you hope they would be when you shoot, mars, wrinkly labels, argh. You couldn’t tell it my your final photos, nice job!